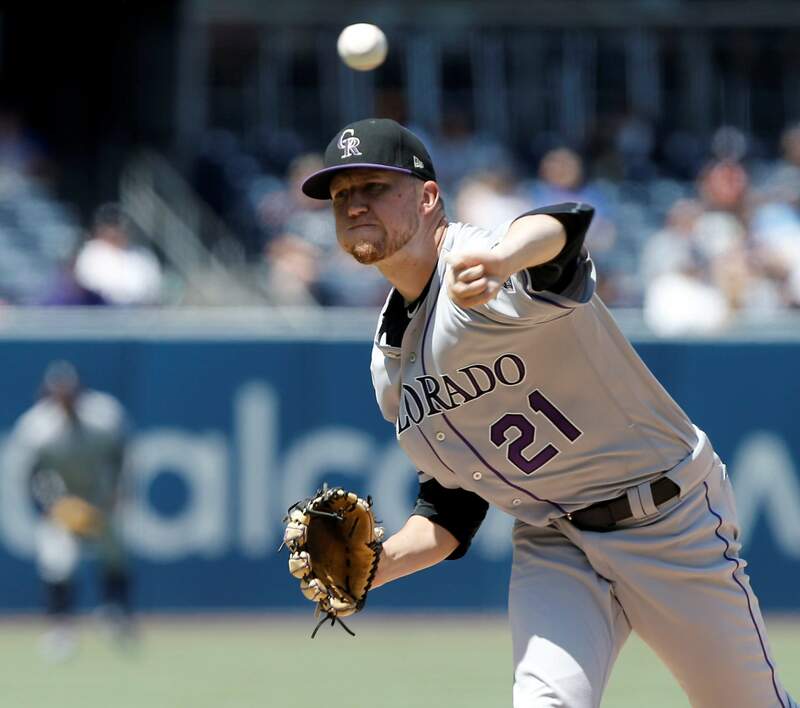 Colorado Rockies starting pitcher Kyle Freeland throws to a San Diego Padres batter during the first inning Sunday in San Diego. Colorado Rockies’ Trevor Story hits an RBI-double during the sixth inning against the San Diego Padres on Sunday in San Diego. 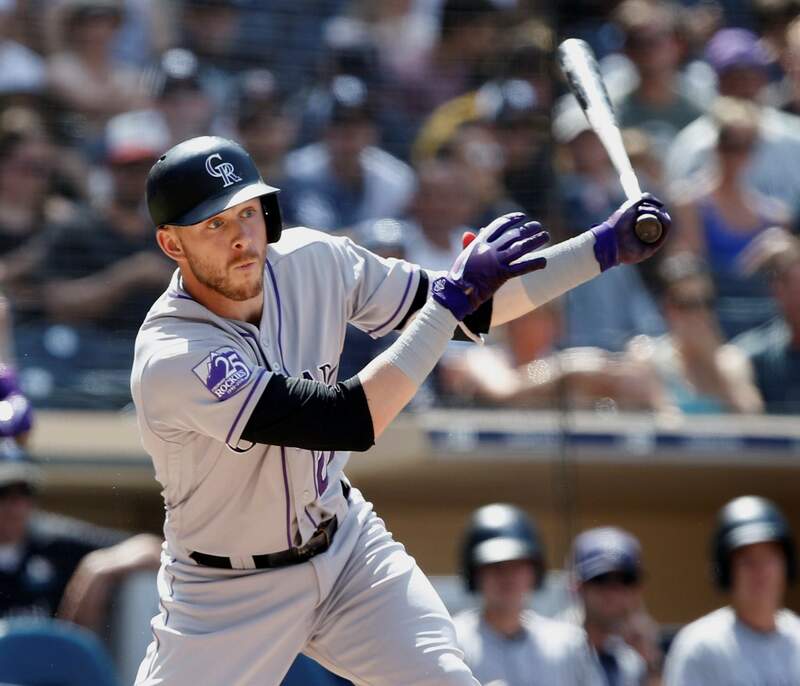 SAN DIEGO – Consecutive losses to the last-place Padres had some people wondering what was going on with the Colorado Rockies. Just as quickly, consecutive wins have the Rockies feeling pretty good about themselves. About an hour after the Rockies won, Los Angeles beat Arizona 3-2. The Dodgers have a one-half game lead over Colorado, with the Diamondbacks another half game back in third. Chris Iannetta hit a go-ahead, two-run double in the seventh inning for the Rockies, who came into the series one-half game behind Arizona before losing the first two games. They snapped San Diego’s four-game winning streak on Saturday night and then beat rookie Jacob Nix (2-3) on Sunday. Colorado, which lost to Arizona in the NL wild-card game last year, won for the third time in seven games. With the score tied at 3, Nix faltered opening the seventh by allowing a leadoff single to Ian Desmond and walking Gerardo Parra before being lifted for fellow rookie Trey Wingenter. Desmond and Parra pulled off a double steal and Iannetta brought them both in with a double to the base of the fence in center. Charlie Blackmon singled with one out to bring in Iannetta. That made a winner of Kyle Freeland (13-7), who allowed three runs and seven hits in six innings. He struck out three and walked two. The Rockies return home for a 10-game homestand that starts with three games against San Francisco and finishes with three against the Dodgers and four against Arizona. “Splitting the series certainly wasn’t what we were hoping for but we’ll take it,” Freeland said. David Dahl homered in the eighth, his eighth. The double steal was big for the Rockies. Nix allowed five runs and five hits in six-plus innings, struck out four and walked two. “I take pride in not walking guys. Nothing frustrates me more than walking a guy and having him score,” Nix said. “Especially like if I ever walk a guy and he steals second then I give up a double, it’s like, that guy shouldn’t have been on base. Freeland got into early trouble when he walked leadoff batter Freddy Galvis and allowed a single to left by rookie Luis Urias. He walked Eric Hosmer with one out and then allowed rookie Franmil Reyes’ two-run single to center for a 2-1 lead. Colorado got a sacrifice fly from Nolan Arenado in the first and a sac fly from Dahl in the fourth, and then tied the game in the sixth when DJ LeMahieu walked with one out and scored on Trevor Story’s double to right. Rockies LHP Tyler Anderson (6-7, 4.79) is scheduled to start Monday in the opener of a three-game series against San Francisco. The Giants will counter with LHP Madison Bumgarner (5-5, 2.68).